Since 2007 I have been working as an Artist Educator at Orleans House Gallery. Initially I joined the Education team as Gallery Activities Co-ordinator. Creating workshops for visiting schools and outreach projects alongside co-ordinating and delivering weekly art clubs and holiday activities. In 2010 I was asked to devise an Early Years Programme. Seesaw is a multi-sensory weekly gallery session that develops the beginnings of a visual language. Our aim is to provide a relaxed and informal environment where adults and children work in partnership to explore their creativity and natural curiosity. I continue to develop and deliver this session. Follow the link to see a short film about Seesaw at Orleans House Gallery. This is an early years programme that explores the elements of Science, Technology, Engineering and Maths. Big ideas are explored simply through creative investigations, arts & crafts activities, music and play. 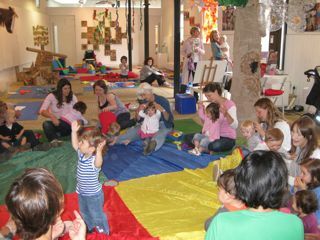 Toddler Time Travel for Wandsworth Museum at Battersea Arts Centre. In this early years programme we travel back in time to explore a unique period in the history of Wandsworth from the time of hunter gatherers to the present day. Multi-sensory activities, arts and crafts, object handling, creative role-play, music, rhyme time and stories are included in every session. I am available as a freelance artist educator to devise and deliver workshops and education programmes in a wide variety of medium. Please contact me for details.